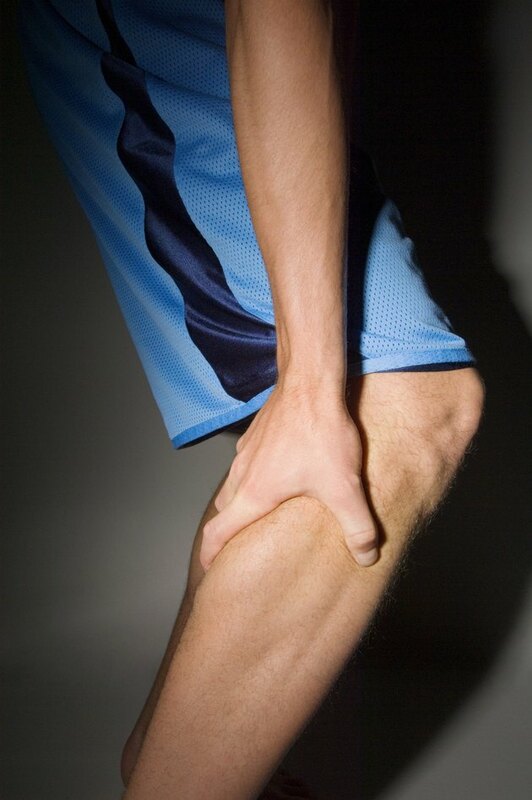 Leg spasms and muscle cramps can be symptoms of certain infections such as the flu. If your sickness is causing diarrhea or vomiting, you could also suffer from an electrolyte imbalance which can cause leg spasms. If your leg muscle pain has lasted longer than three days or you have other serious symptoms along with the pain, consult your physician. There are many different strains of the flu virus; however, they all can cause similar symptoms. Five to 20 percent of the American population contracts the flu each year. More than 200,000 people are hospitalized in the United States each year for flu-related complications, according to the United States Department of Health and Human Services. In addition to body aches and muscle spasms, the flu can cause a fever, coughing, sore throat, runny nose, chills, fatigue, nausea and vomiting. Nearly all strains of the flu can cause aches and pains throughout the body. Muscle spasms can be a symptom of the flu, especially if you also have additional symptoms such as fever or sore throat. If you are experiencing diarrhea or vomiting, you could have an electrolyte imbalance caused by dehydration. Without sufficient fluid intake, you can lose too much sodium and experience muscle spasms or cramps. Other symptoms include muscle weakness, mental confusion, fatigue, headache and irritability. If you are noticing leg spasms with the flu, certain medications and home remedies can help. However, the leg pain will likely persist until you have gotten over the virus. Ibuprofen can help to relieve pain in your legs. A warm bath or massage can help to reduce your muscle spasms. If your leg spasms are related to dehydration, it is important that you rehydrate your body. Sports drinks can help to replace lost electrolytes. The flu can cause serious complications in some people. If you are unable to keep liquids down, seek emergency medical attention. Dehydration can be fatal if not treated. You should visit a medical provider for other serious symptoms, such as a fever over 104 degrees Fahrenheit, difficulty breathing or confusion. If your leg spasms last longer than three days or are accompanied by a stiff neck and high fever, visit a doctor to rule out any other issues.